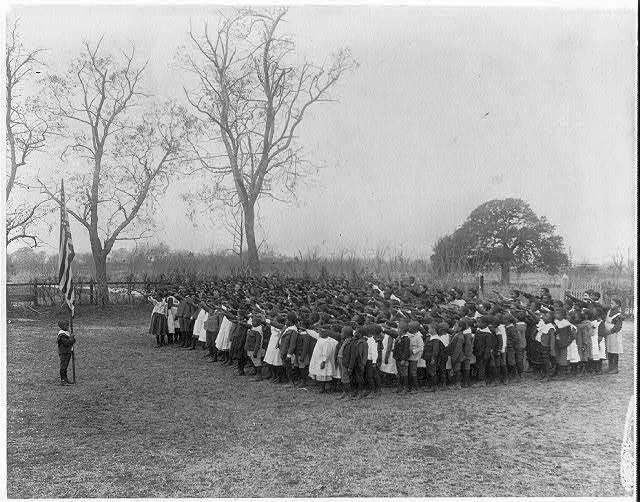 KNOW YOUR HISTORY: Memorial Day was started by former slaves on May, 1, 1865 in Charleston, SC to honor 257 dead Union Soldiers who had been buried in a mass grave in a Confederate prison camp. They dug up the bodies and worked for 2 weeks to give them a proper burial as gratitude for fighting for their freedom. They then held a parade of 10,000 people led by 2,800 Black children where they marched, sang and celebrated.Thanks to Abstrakt Goldsmith for this nugget of history that most of us never learned in school. To this, I say, why do we fight?? What is it about human nature that makes them believe that they must kill other human beings for their freedom? The Glory of war is not glorious. Ask those who do fight. The first casualty of war is “Truth”. People are trained, brainwashed and distorted to believe that their leaders who do this to them would not lie to them, would not line their pockets with blood money and would care for them upon their return from the Battlefield. All to often we see our fellow human beings become inhuman in their acts of warring against other human beings. And then they return home and are given ribbons, ribbons that honor how heroically they “killed” another human being for our “freedom”? The depth of the absurdity and cognitive dissonance is overwhelming. How does creating a war culture, a militarized environment, a police state, a surveillance state a cult of oppression of other human beings, give us freedom? Our troops have their humanity removed from them as they are trained to believe that killing for freedom is tantamount to Patriotism. Patriotism is tantamount to all previously perceived values and standards. To be Patriotic means to stand by your government, even if it is found to be lying and creating scenarios in which you must risk your life and kill others, conquer others and invade others to maintain your freedom at home. The stalk reality that this aggression breeds more aggression and diminishes humanity to a banal state to me is the result of mass graves and disregard of the humanity of others. This is not a political, racial, ethnic, national problem, it is a human problem, and it is the human being who continually takes the freedom and sovereignty of other humans in their so-called quest for “freedom” at home. An aerial view of this idiocy could cause humanity to stop and think, what is the purpose of this? Who profits? And more importantly, what is this doing to our basic humanity? Is it really about defense or is it really about DOMINANCE? Links and Commentary:There appears to be many variations on this theme and a bit of a debate as to who started what and when. The links below will show the differences in the history and opinions on this. I think that this story shows the true horrors of war, something that would have been denied or ignored not because the Freedmen acknowledged the fallen soldiers but because of the way those fallen soldiers were treated on American soil. During the closing days of the Civil War, the area was used as a prisoner-of-war camp. More than two hundred Union soldiers died in the camp and were buried in a mass grave at the site. Union soldiers were buried behind the old racetrack’s stands near the present intersection of Tenth Ave. and Mary Murray Drive. “The city was largely abandoned by white residents by late February. Among the first troops to enter and march up Meeting Street singing liberation songs was the 21st U. S. Colored Infantry; their commander accepted the formal surrender of the city. 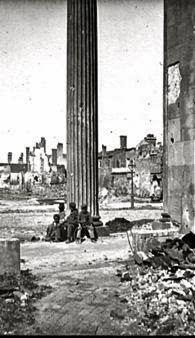 “Thousands of black Charlestonians, most former slaves, remained in the city and conducted a series of commemorations to declare their sense of the meaning of the war. The largest of these events, and unknown until some extraordinary luck in my recent research, took place on May 1, 1865. During the final year of the war, the Confederates had converted the planters’ horse track, the Washington Race Course and Jockey Club, into an outdoor prison. Union soldiers were kept in horrible conditions in the interior of the track; at least 257 died of exposure and disease and were hastily buried in a mass grave behind the grandstand. Some twenty-eight black workmen went to the site, re-buried the Union dead properly, and built a high fence around the cemetery. They whitewashed the fence and built an archway over an entrance on which they inscribed the words, ‘Martyrs of the Race Course’. By late April 1865, a white picket fence on which was written “The Martyrs of the Race Course” had been erected. On May 1, 1865, thousands of people, mainly newly freed blacks, processed to the site, and members of the 54th Massachusetts Volunteer Infantry marched around the site. The graves were decorated, speeches were offered, and celebrants enjoyed picnics in the area. This has been cited as the first Memorial Day celebration. 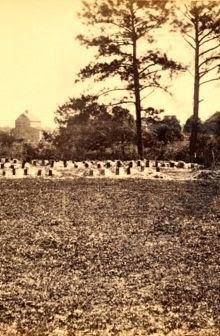 By 1871, the cemetery was suffering neglect, and the soldiers were reinterred at the Beaufort and Florence National Cemeteries. Watch Memorial Day on PBS. See more from American Experience. ” In the May 1865, the newspaper covered what Blight argues should be credited as the nation’s first memorial day observance, held on May 1, 1865. 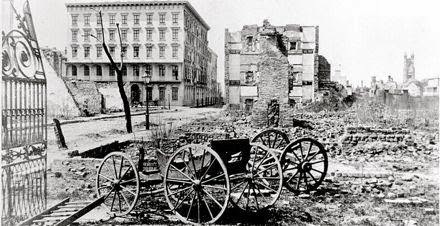 At that time, Charleston was largely in ruins and families were eager to rebuild their lives and their city. The photos on this page are Library of Congress images from the era. Two simply show scenes of wartime devastation in the city. But the photo at right here appears to show the land where the former Confederate prison camp stood (also the site of a pre-Civil War Race Course). The photo appears to show work beginning on raising the remains in April 1865 in preparation for the new cemetery that eventually would include a wall, an archway entrance and properly buried remains. Militarism is glorified in the west. We are asked to “remember” the fallen, yet keep fighting in these same unjust conflicts at the same time (many of which we are responsible for starting). It makes no sense? The U.S. is one of only two countries which has not ratified the convention regarding the use of child soldiers. They are also the largest arms dealers in the world (here is our WMD). War is all about greed, power, and exploiting the powerless. War has nothing to do with freedom, loving your country, or being a hero. War is about killing innocent people, stealing what they have and keeping power over them through violence & propaganda. A FRACTION of the money spent on the military industrial complex could eradicate hunger (Food, Not Bombs! ), and all other social and ecological problems humanity faces (saving lives instead of taking them).